It is a sad irony that we have cataloged individual photographs of the remaining North Atlantic right whales and given each of them unique numbers and sometimes names, yet still know too little about their physiology, behavior, and habitats to take effective steps toward ensuring their survival as a species. Rapaciously hunted by humans over centuries, the North Atlantic right whale has not recovered in the decades after whaling was outlawed. Living near heavily populated coasts, the whales are vulnerable to the high levels of shipping, fishing, noise, and pollution. At the dawn of the 21st century, right whales are at a critical time in their long history—pointed dangerously toward extinction by the end of the century. Now, an ambitious program of intensified research has begun finding ways to aid them. We now know that the mission is possible. Using extensive right whale data collected by government agencies, researchers, and dedicated private groups, WHOI biologist Hal Caswell and colleagues analyzed the factors contributing to the species’ population decline. Saving just two females per year from untimely death, they concluded, can reverse the downward trend and put the population on a road to recovery. But despite years of research on right whale habits and habitats we still lack practical ways to reduce deaths or increase births. Learning the secrets of huge and uncooperative animals that can be studied only fleetingly at sea or dead on a beach is a daunting task. In November 2003, the WHOI Ocean Life Institute (OLI) convened a research forum in Woods Hole, gathering scientists and engineers from several institutions, along with representatives from government and industry, to assess the status of the North Atlantic right whale (http://www.whoi.edu/institutes/oli/activities/rwforum.html). Blending a diverse range of complementary expertise, they devised a collaborative research plan to accelerate advances in our knowledge of right whales. The OLI Right Whale Research and Conservation Initiative complements other government and academic programs, supplying essential pieces of the North Atlantic right whale puzzle they don’t address. It will provide a necessary scientific foundation to guide effective conservation efforts. monitoring the North Atlantic right whale population to assess its size, present state, and future viability. Right Whale Initiative strategies include pioneering studies of whale hearing, using CT scans to obtain physiological data on whale ears, and field work to study whales’ response to noise. Other scientists will study whale bone forensics to provide basic information on the speeds and masses of vessels that prove fatal in ship-whale collisions. Another study will explore hydrodynamic forces, caused by ships moving through water, that lead to collisions. Scientists will also test new types of fishing gear designed to slip off more easily and break when entangled whales try to free themselves. A remote control device is being developed to deliver sedatives and medications to entangled whales, to improve our ability to disentangle them. deploy rapid-response expeditions to explore whale feeding and diving behavior. modeling studies to target critical factors threatening the population and more effective conservation strategies. 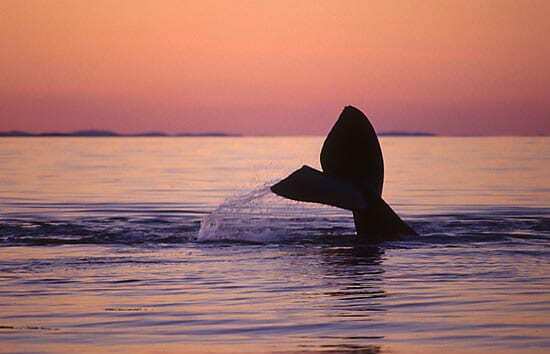 Time is running short for the North Atlantic right whale. Now is the time for scientists and supporters to work together to keep this magnificent mammal swimming off our shores. HIT BY A SHIP—A necropsy of this 50-ton, 45-foot right whale, washed onto a beach HIT BY A SHIP—A necropsy of this 50-ton, 45-foot right whale, washed onto a beach in Wellfleet, Mass in 1999, showed a broken jaw, five fractured vertebrae, damage to the left flipper, and internal bleeding. The whale, known to researchers as Staccato, was a mature female that had given birth to many calves. Research has shown that saving just two mature females per year from untimely deaths could reverse the decline of the North Atlantic right whale population. in Wellfleet, Mass in 1999, showed a broken jaw, five fractured vertebrae, damage to the left flipper, and internal bleeding. The whale, known to researchers as Staccato, was a mature female that had given birth to many calves. Research has shown that saving just two mature females per year from untimely deaths could reverse the decline of the North Atlantic right whale population. Photo by Vincent DeWitt, Cape Cod Times. Woods Hole Oceanographic Institution scientists and colleagues are working to help improve the survival rates of the right whale.